Niccolò Machiavelli was born on May 3, 1469, in Florence, Italy, of nobility, though by no means wealth. His parents, Bernardo and Bartolomea, had three other children, two daughters and a son. Bernardo was a lawyer and small landowner with a small salary. Machiavelli's education started at age seven. Some accounts say that Machiavelli spent the years from 1487 to 1495 working for a Florentine banker. A love of books was a family value that Machiavelli shared. His writings prove that he tirelessly read the classics. In 1498 Machiavelli was named chancellor (secretary to a nobleman, prince, or king) and secretary of the second chancellery (chief executive officer) of the Florentine Republic (government in Florence whose leaders were voted for by citizens). His duties consisted chiefly of carrying out the policy decisions of others, writing diplomatic letters, reading and writing reports, and taking notes; he also went on some twenty-three diplomatic missions (formal visits by a representative of a nation to foreign countries to conduct discussions on international affairs) to foreign states. These included four trips to France and two to the court of Rome. In 1502 Machiavelli married Marietta Corsini, who bore him four sons and two daughters. 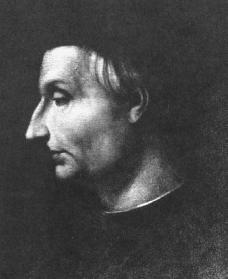 His grandson, Giovanni Ricci, is credited with saving many of Machiavelli's letters and writings. removed their leader Soderini, a man Machiavelli characterized as "good, but weak," and allowed the Medici, a family formerly in power, to return. On November 7 Machiavelli was dismissed from his role as chancellor. Soon afterward he was arrested, imprisoned, and subjected to torture as a suspected schemer (one who plots or plans) against the Medici family. Though innocent, he remained a suspect for years to come. Unable to secure an appointment from the reinstated (reestablished) Medici, he turned to writing. Machiavelli had a passion for ancient history. He had a fierce desire to rebuild the government with a stronger political and moral foundation, similar to that of the Roman Republic (107–101 B.C.E. ). He felt the biggest need of his day was a strong political and military leader who could bring together northern Italy, ridding it of French and Spanish influence. At the time that he wrote The Prince he pictured such a possibility while the restored Medici ruled both Florence and the papacy (system of government of the Roman Catholic Church of which the pope is the head). This hope is played out in the final chapter of The Prince. It is a heartfelt plea to his Medici patrons (people who support a specific cause, a person, or an establishment) to set Italy free from the "barbarians." It closes with a quotation from Petrarch's patriotic poem Italia mia: "Virtue will take arms against fury [anger], and the battle will be brief; for the ancient valor [courage] in Italian hearts is not yet dead." No one listened to this plea in 1513, but it was to play a role three centuries later in the Risorgimento (a movement for Italian unification). The chapters of The Prince are written in a clear and straightforward style. Earlier political writers had treated politics as a branch of morals. Machiavelli broke with this long tradition and treated politics on its own. Machiavellian politics described the world as it was, rather than what people imagined or were taught to believe. This was a big change in tradition. Abandoning the Christian view of history as guided by God, Machiavelli viewed events in purely human terms. Often it is fortune that gives—or takes away—the political leader's opportunity for significant (important and meaningful) action. Like others in the Renaissance, Machiavelli believed that man had the ability to control his own fate. This was the opposite of the Middle Ages' (period in Western European history that started with the end of the Roman empire and continued to the fifteenth century) concept of an all-powerful divine will (a higher soul or spirit that controls the destinies and actions of all) or the ancient Greeks' crushing fate (inescapable downfall). Machiavelli's virtù (artistry) in politics—unlike Christian virtue—is a useful combination of force and level-headedness. Serious critics of Machiavelli sometimes forget that he attempted to describe rather than to invent the rules of political success. For him the state was greater than its citizens and their individual interests; its health consisted in unity, but even at its height its lifetime was expected to end at some point. Certain passages in the Discourses (I, 11 and 12; II, 2) explained Machiavelli's argument with the Church: by bad example, the court of Rome, Italy, had lost its devotion and religion; the Italian states were weak and divided because the Church, too weak politically to dominate them, had nevertheless prevented any one state from uniting them. He suggested that the Church might have been destroyed by its own corruption (deception and lies) had not St. Francis (c. 1182–1226) and St. Dominic (c. 1170–1221) restored it by founding new orders. However, Machiavelli gives a good comparison between the pagan (religion of many gods) religion of ancient Rome and the Christian religion. As a historian, Machiavelli in his History of Florence did better than earlier historians, because he focused on the underlying causes rather than the chain of events in the history of the Florentines from the death of Lorenzo de' Medici (1442–1492) in 1492. Medici was an Italian merchant prince who, without an official title, led the Florence government until his son took over. Machiavelli stuck closely to his motto that a servant of government must be loyal and self-sacrificing. Nowhere did he suggest that the political morality (sense of right and wrong) of princes is a model for day-to-day dealings between ordinary citizens. His reputation as being evil and disloyal is largely undeserved; it began not long after his death. His works were banned in the first printed Index (1559). In Elizabethan England (England during Queen Elizabeth's reign, 1558–1603), Machiavelli was represented on the stage and in literature as evil. The primary source of this misrepresentation (incorrect presentation) was the translation into English by Simon Patericke in 1577 of a work popularly called Contre-Machiavel, which misrepresented Machiavelli and blamed his teachings for the St. Bartholomew Night massacre of 1572 (a night chosen by the Queen of Florence to rid the city of all non-Catholics). A poem by Gabriel Harvey the following year falsely blamed Machiavelli for four principal crimes: poison, murder, deception (the act of lying and cheating), and violence. Machiavellian enemies followed in works by other playwrights (writers of plays). Machiavelli's values are represented in nineteenth-century liberalism (political philosophy based on belief in progress, the goodness of man, and individual freedom). Both Machiavelli and liberalism support government over religious power, the recruitment (the act of bringing together) of citizen armies, the preference for a government with voting citizens and elected officials rather than a king or queen, and the ideals of honesty, work and society's responsibility overriding the lone citizen's. Though he was unappreciated in his time and times thereafter, Machiavelli's influence lives on in the thinking of people worldwide. He died in Florence in June 1527, receiving the last rites of the Church that he had bitterly criticized. Godman, Peter. From Poliziano to Machiavelli. Princeton, NJ: Princeton University Press, 1998. Viroli, Maurizio. Niccolò's Smile: A Biography of Macchiavelli. Edited by Antony Shugaar. New York: Farrar, Straus, and Giroux, 2000. I think you got his death correct. Some people think it was in May. I liked your information. Thank you! Great information you helped a ton with my school report. Thank you so much! You saved me from the wrath of my English teacher.